The basis of the translation: that the Bible was inspired by God and is without error as originally given by God. A short history of the translation. The aims of the translation. An explanation of which Biblical texts were used and why. 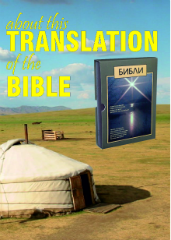 How the nature of God was conveyed in the history of Bible translation into Chinese, Japanese, Korean, Kalmyk Mongolian and Buryat Mongolian. Also included are the issues surrounding the process of accurately conveying God's nature in Mongolian in the nineteenth century and today. An explanation that the writers of the New Testament quoted from the Greek translation of the Old Testament in the third century BC rather than from Hebrew. The fact that the mystery of God is not related in Biblical terms with obscure, hidden meanings, but that God, of his own volition, did what he did. How Bible proper nouns are transcribed. A declaration that although the original message God gave was without error, this and every translation of the Bible is imperfect. A short summary of the contents of the Bible. Some ideas about different approaches in how to read the Bible. More considerations about expressing the nature of God in Mongolian.